Did you hear the interview with Dave on Pulse Mornings this week and want to find out more about the Greater Des Moines Leadership Institute’s PROJECT PANDA? Find out how you can get involved with their new grief center and help central Iowa families heal after the death of a loved one. Here’s a link to more information! It is interesting that the smallest of all seeds is used as an analogy for the Kingdom of Heaven. The mustard seed is not only tiny – the plant is not beautiful or luxuriant – but also rather practical. Jesus says that once this plant has grown, this small seed produces a perfect place for the birds of the air to find shelter. 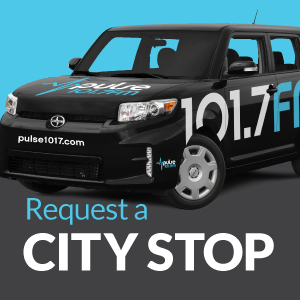 Pulse 101.7 is all about helping people to find shelter. When our Good Music and Good Words hit the road each day we are inviting you to “take cover” in good lyrics and a great array of awesome songs and artists. We come from many walks of life in central Iowa – and around the country and world. But we all aspire to the same destination. Our forever home in the Kingdom of Heaven. Thanks for helping Pulse 101.7FM launch strong into our 20th year. Your monthly pledge of $30 or your choice to sponsor an entire day of programming at $840 is a huge help in accomplishing our mission. Thanks for listening – thanks for giving! There’s a lot of celebrating going on around here this month. Pulse 101.7FM celebrates our 19th birthday, entering our 20th year on the air in Central Iowa… and we’re excited for what the future holds! As has been the case all along, Pulse 101.7FM is two-thirds listener supported (the other third comes from our loyal ad partners). Your sacrifice of $10, $30, $50 or more per month is what makes this great station work, and we can’t do it without you! It’s vitally important that we increase our monthly support from 180 monthly ‘givers’ to 250. Will you join in the Pulse Mission this year with your pledge of support? You can give here, or by calling (515) 987-9995. Know that you are greatly appreciated, and that you help to make a DIFFERENCE for thousands of listeners! Thank You!! !